Today I had the good fortune of being invited by Executive Producer Carlos Keyes to observe a day of shooting on the set of the highly anticipated found footage horror/sci-fi film “Black Wake” (2016). As a native New Yorker and avid fan of found footage this was too good an opportunity to pass-up, so I headed over to the filming location: Great Falls National Historic Park in Paterson New Jersey. 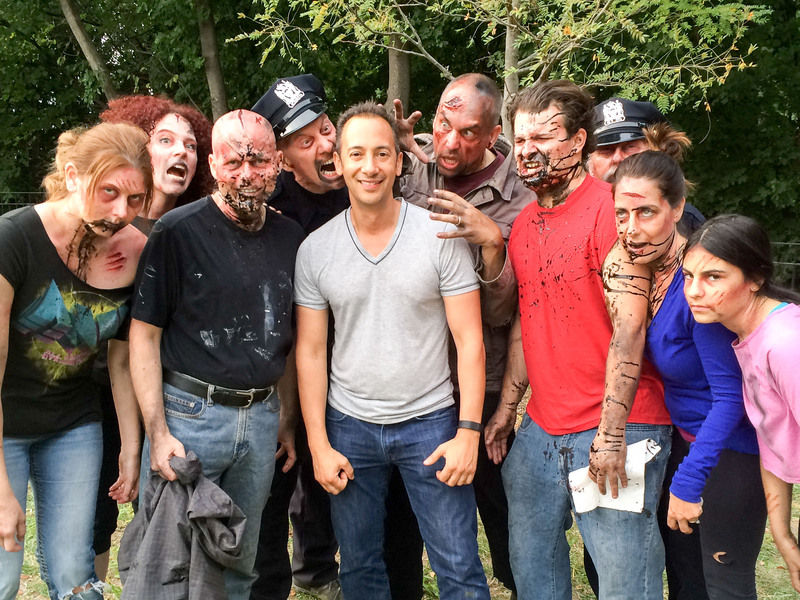 Black Wake is written by Jerry Janda, directed by Jeremiah Kipp, and has an all star cast featuring Nana Gouvea, Tom Sizemore, Eric Roberts, Jonny Beauchamp, Rich Graff, and a contingent of hard-core zombies I met during the day’s filming. Upon arrival I was met with open arms by Director Jeremiah Kipp and Executive Producer Carlos Keyes, who both graciously introduced me to all of the cast and crew that were onsite for the day’s shooting. During my stay I was offered open-access to all of the day’s activities. 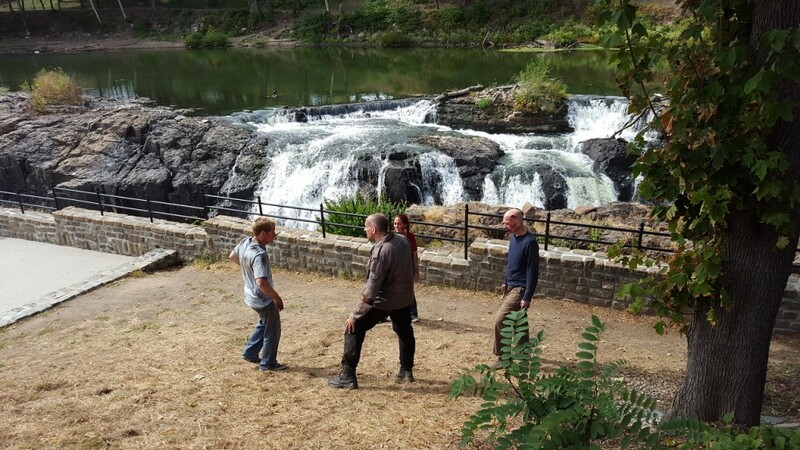 This article is the first of several that will cover different aspects of the Black Wake shoot at Great Falls National Historic Park. Observing Jeremiah Kipp, Carlos Keyes, and the rest of the cast and crew working in tandem on-set was like watching a well-oiled machine in action – it was clear from the start that this team developed a synergy that made a day of otherwise complex shooting in multiple locations move like clockwork. With the great working relationship between the cast and crew and unwavering dedication to their craft, in concert with the “let’s work, but also have fun attitude,” I have no doubt that Black Wake will be everything and more that the team set out to produce. I had an opportunity spend time with Carlos Keyes on the set of Black Wake to discuss the film. Carlos Keyes is a highly personable individual, and always willing to lend a hand on set wherever needed, no questions asked – And it’s this selfless attitude from not only Carlos Keyes, but the rest of the cast and crew that will ensure the success of Black Wake. Found Footage Critic: Black Wake has all the ingredients for success: a great script, proven director, all star cast, and a dedicated team to make it happen. How did you get involved with this project? Carlos Keyes: Nana Gouvea met Director Jerimiah Kipp at an audition for a vampire role in one of his films and she talked to him about other projects. Afterwards, Jeremiah brought me the script [for Black Wake] and we decided to do this. I liked the story and we talked about how we can make the film, and from there we did some rewriting. The original script wasn’t long enough; it was between a short and a feature in duration. We had some conversations with the writer, Jerry Janda, and expanded on the story to bring it to feature length. Once the revised script was complete, we brought in Tom Sizemore, Eric Roberts, Jonny Beauchamp, and Rich Graff. Found Footage Critic: How did you come across “Great Falls National Historic Park” in Paterson NJ for today’s shoot? The waterfalls are breathtaking, and there are countless unique environments to film. 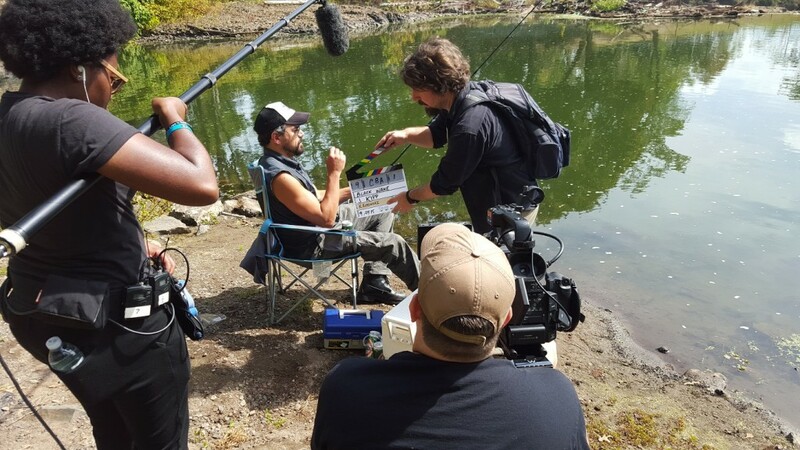 Carlos Keyes: Although principal filming is in the New York region, Black Wake is supposed to take place in “Anywhere USA” – We want the audience to feel like this could happen anywhere. We scouted the region and came across Great Falls National Park. The location includes a variety of different environments that can be used to represent a lot of different locations throughout the United States. Most importantly, however, the parasites that infect the people in Black Wake come from water and are drawn to water, making this an ideal location. Found Footage Critic: Given the all-star cast and ambitious script, may I ask what the budget is for Black Wake? Carlos Keyes: The total cost will probably come in around $300,000. There are still plenty visual effects and other work to be done. Until we complete post production, we won’t know exactly where the total cost will fall. 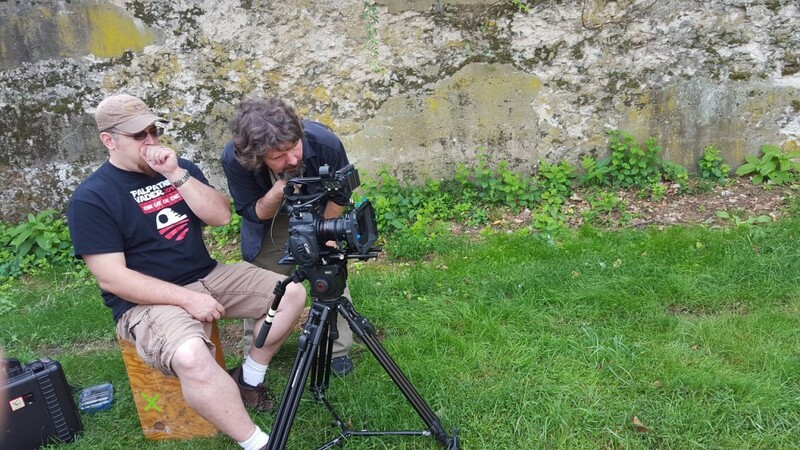 We have a lot of work that we would like to do in post-production, and as the story started taking shap we wound up shooting more days than originally planned for. Even today’s shooting was not in the original budget! This additional work is going to pay-off and make for a great film. Found Footage Critic: I imagine there are sizeable special effects given that Black Wake is both a horror and science fiction film. What is the mix of practical effects versus CGI in Black Wake? Carlos Keyes: We have quite a bit of practical effects, but there will be quite a bit of CGI as well. We’re combining both techniques to make the best possible film. Found Footage Critic: From what I’ve seen, Black Wake puts an entirely new spin on the zombie genre. How would you characterize Black Wake compared to other zombie films? Carlos Keyes: Black Wake is going to be a lot more interesting than most traditional “zombie” films – the zombies in Black Wake are the result of people that are infected from parasites that live in the sea. The narrative is wrapped around our lead character, the scientist (Nana Gouvea), and we see from her perspective how everything evolves and why things are happening. In Black Wake, the zombies are not looking to eat flesh, they have other motives – the zombies are gathering information for something and we don’t have all the answers. Found Footage Critic: Will Black Wake have a theatrical run? Carlos Keyes: I’m in serious discussions for distribution in theaters across multiple countries. In the United States, at the very least, we’re planning on a limited run. We’ll absolutely have a New York premier since this is where principal filming was held and many of the cast and crew are New Yorkers! 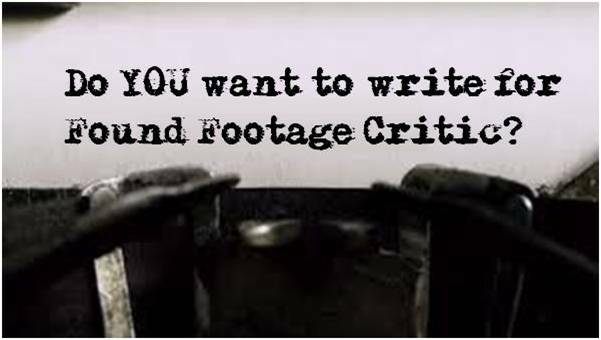 Found Footage Critic: Many veteran filmmakers have said that although found footage films may appear simple to produce, in actuality, the genre is much more challenging than traditional cinematically shot films. 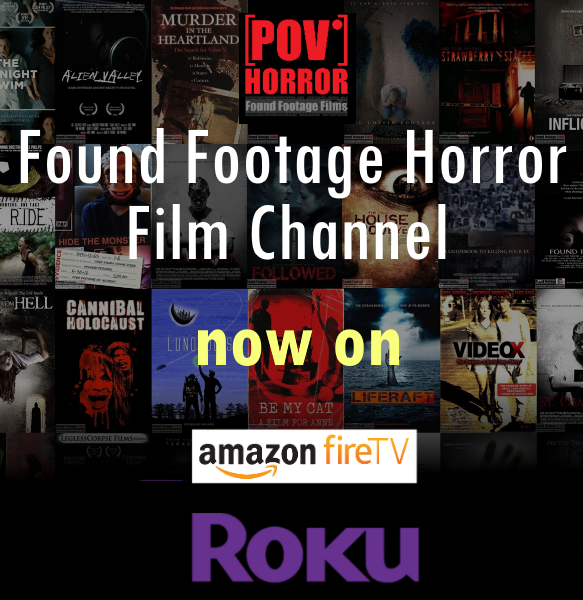 Having gone through this process, what are your thoughts on producing a found footage film? Carlos Keyes: There are a lot of things that you can’t do in a found footage film that you would do in a cinematic film. For example, you can’t use dream sequences or include other scenes where a camera normally wouldn’t be available to shoot. Filming as found footage makes it more challenging to create footage with a valid justification as to how it got there. Black Wake has solid justification covering all of the footage used in the film. There’s nothing in the film that can’t accounted for by a known camera. 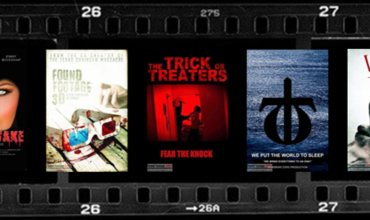 Found Footage Critic: The first Black Wake teaser trailer comes across as 100% pure found footage, while the second (recently released) teaser trailer “feels” more cinematically shot. Why are the two trailers so different from one another in look and feel? Carlos Keyes: The first teaser trailer was critiqued as looking “low budget”, a preconceived notion many people seem to have with found footage films in general. While this may hold true with some found footage films, Black Wake is a well thought out story with great cinematography and great acting. We intentionally edited the second teaser trailer look more cinematic-friendly, although all the source material is 100% found footage. Found Footage Critic: Is there anything else you’d to tell everyone about Black Wake? Carlos Keyes: Black Wake is an intriguing story and when people see the film, I’m sure they are going to like it. We’ve produced an amazing film that’s only going to get better as we continue to refine it in post production. In the coming weeks FFC will continue coverage of Black Wake (2016) with an exclusive interview of Director, Jeremiah Kipp and other cast and crew, so check back for future updates!